The first Alberg 30 was launched in the summer of 1962. The design had been commissioned by Kurt Hansen of Whitby Boat Works, Ltd. He'd looked at the 28-foot Pearson Triton and felt he could build a similar boat in Canada for much less than the price of importing the US-built Triton. So Carl A. Alberg [1901-1986] designed a slightly larger cousin. It's been said that he based the design on the "Odyssey", designed by Carl for San Francisco Bay and the Pacific, but the build dates make that unlikely. Intended for the heavy weather of the San Francisco Bay and the Pacific Ocean, the Odyssey had a heavy displacement and a 7/8ths rig. The original Alberg 30 drawings followed this design with 2000 pounds less displacement and 3 inches less draft. Kurt Hansen changed the ballast from the designed lead to cast iron to hold down the production costs. In some of the early boats, the weight was insufficient and internal ballast had to be fixed in the bilge. Then, after the molds had been made, the syndicate of sailors who had ordered the boats decided they wanted a masthead rig. It was too late to move the mast step aft the 24 inches that was required, so, instead, the mast was shortened and the jib stay was raised. Carl Alberg wasn't pleased with the decision, but later admitted, "It seems to have worked out ok."
The end result was still a sturdy, sweet-sailing boat. This letter is both a 1) testimonial and 2) request for advice. 1) We bought our Alberg 30 in 1966. We went aground under full sail on rocks with kelp to a depth of less than one foot. We were dragged off by a power boat. Damage -- a few scratches on the keel. Many minor groundings on gravel and rocks over the years with not even scratches resulting. This year we went aground at five knots (power) on a rocky reef (no kelp) and pounded hard many times. Damage -- a few deep scratches on keel and bottom of rudder chipped. Also this year went aground under full sail on rocks, but got off with the motor. Result -- no damage. 2) Would you please advise me as to the best method to duplicate your strong construction when I repair these deep scratches and the rudder where it is gouged? I want a perfectly smooth hull (keel and rudder especially) and want it strong. Carl Alberg advised the writer to move to the Chesapeake Bay where the bottom is mud. 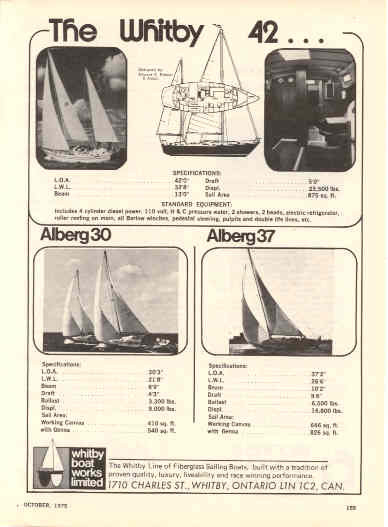 Glenn Brooks, owner of Dolce #318, has compiled a list of Alberg30 Circumnavigations (PDF). Or, maybe you want to look at the pictures.